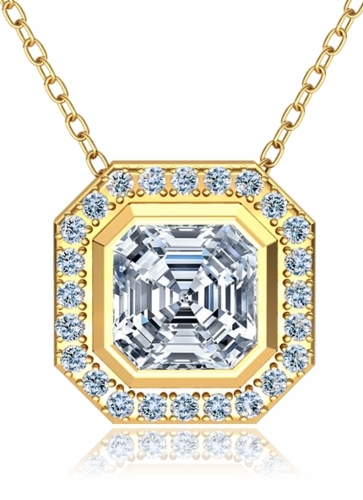 The Vistancia 10 Carat Asscher Cut Bezel Set Cubic Zirconia Halo Pendant features a stunning simulated diamond cubic zirconia 13mm asscher cut center framed by a halo of diamond look rounds. Our inspired asscher cut version has many small step cuts along the top area and larger longer facets underneath the stone. 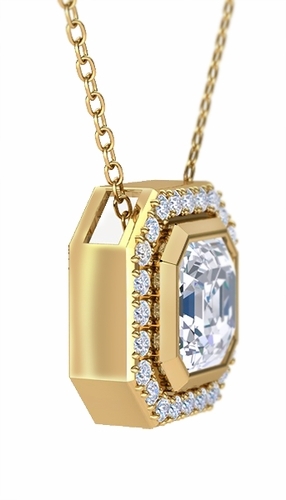 This pendant is a definite show stopper that commands attention and measures approximately just under 1 inch in length and width. 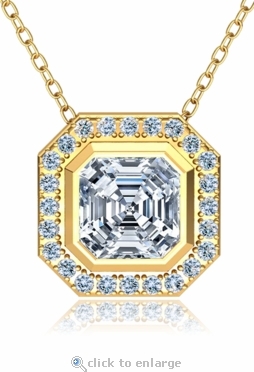 A hidden bale is utilized as to not detract from the beauty of the pendant. 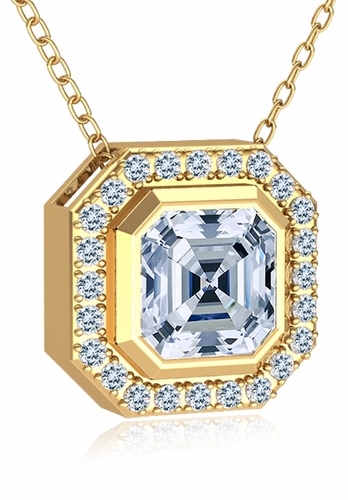 Our Russian formula cubic zirconia is hand cut and hand polished to exact diamond specifications and is set in a high quality mounting made in solid 14k white gold, 14k yellow gold, or 14k rose gold. Asscher cut center stone color options include man made red ruby, green emerald and blue sapphire in addition to diamond look, yellow canary and pink simulated diamond look. Comes standard with a 16 inch length chain or upgrade to an 18 inch length chain. For further assistance, please visit us via live chat or call us directly at 1-866-942-6663, option 2 to speak with a knowledgeable representative.